One hundred years ago, in early 1916, Ernest Shackleton’s plans lay in tatters. Having set off two years earlier to be the first to journey across the Antarctic, this Anglo-Irish explorer and his men had lost their ship to crushing ice. They were stranded on an ice floe in the Weddell Sea facing a bleak and uncertain future. Some people would be broken by such a disaster. Shackleton had to cope with the certainty that his very public plans would never come about and face up to the challenge of keeping his men alive over 18 months in the most inhospitable environments in the world. Shackleton was to journey over ice, across sea and over mountains to save his men by August 1916. He led his team through the worst kind of change, the kind of change that is thrust upon you. Either the change defeats you, or you master the change. I tend to talk about Shackleton when I am guiding people on how to lead their teams through change. Often leaders have no choice about whether change will become part of their lives – their market is changing, customers are moving away, funding is being cut – so they either have to face up to it or they fail. Here are some ways in which Shackleton faced up to the challenge. Shackleton’s key success was in accepting that his original goal, to journey across the Antarctic, was unattainable. He then adapted his purpose to ensuring all of his men got back alive. Others would have kept focussed on the original goal – this would, no doubt, have been admired by those who respect “never giving up”, but they would all have died. The ability to accept and adapt is key when being faced with circumstances beyond our control. That’s how we regain a measure of control for ourselves. We have to be goal focussed to make change happen, but when we fail to see that the goal itself is no longer valid, that’s when we fail. Under those circumstances, we have to step back and work out what is really important, and then reset the plan back to that. I once found myself talking with the leader of a team of volunteers that was struggling to perform because they had uncommitted people in key roles. Sadly, it seemed that no amount of team building or inspirational leadership could influence the level of commitment of those people. To resolve the situation, their leader chose to accept that in the short term, their performance goals would have to go unmet. She redirected her energies to rebuilding her volunteer team, bringing in passionate high performers and got this stronger team focussed on achieving future goals together. It is extraordinary to me that Shackleton managed to bring all his men back after being marooned in such a hostile place for so long. I’m inspired by that when I run workshops for managers who are trying to work out how to lead their teams through change. We talk about the fact that each individual person has their own unique take on the change that is happening and their own unique journey through the stages of denial, anger, depression, acceptance and commitment. Our role as leaders is to provide direction and nurture in equal measure. Our people need to understand the reason for the change, put in the context of the purpose of the team. They need to understand what the leader expects of them, expressed in ways that is useful to each individual – some people need lots of detail, some people will respond better to a high level vision and a nod in the right direction. We need to listen with true compassion and empathy while at the same time showing a path for them to follow. I have worked with people who see those who raise doubts or challenges as blockers to be removed or side-stepped. I disagree – each person needs to work through their fears and uncertainties, and we must make it safe for them to raise them. That takes time, patience and lots of listening – real listening, not just nodding sagely! Don’t complain about the time it takes, just plan for it. When we do, then we get loyalty, trust, and we might just find out some things that will help us to achieve the goal. One of the most common complaints in change programmes is that there isn’t enough information. In my experience, that complaint exists even when lots of information has been provided. The problem is that communication not just requires information to be shared, it requires that information to be received. When we are leading our teams through change, we need to make sure that we are receiving all the information that is out there, and that we are filtering it so that we can share what is useful to our own teams. Before a plane takes off, there’s always a safety briefing. They always say that if you are travelling with young children, you should put on your own oxygen mask before putting masks on others. That applies to change too – we have to take care of ourselves if we are to take care of others. Just as Shackleton had to come to terms with the change he had to adapt to, we all have to go through that process of acceptance. These changes often have a bigger impact on us as leaders than it has on our teams. We not only have to go through the change ourselves, with all the disruption those changes bring, we have then to stand in front of our teams and lead the way. I have worked with some change leaders who feel guilty for taking time out to explore what the change means for them personally. They feel they are wrong to go through the same stages of anger and frustration that their teams go through. They feel they should apply themselves 100% to the team and that they are not allowed to have the same feelings of doubt and uncertainty. What I say to them is that they need to take care of themselves first, in whatever way works for them. We have to invest in our own resilience. 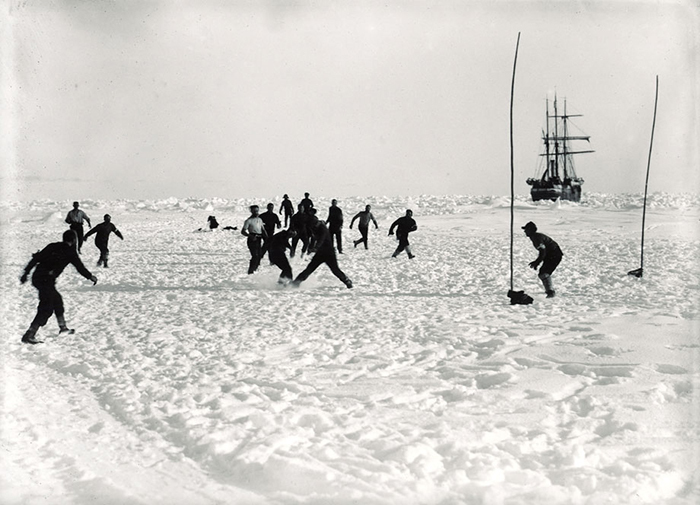 100 years ago, Earnest Shackleton led his people to safety, against all the odds. He inspired them through his acceptance of the need to change, his absolute commitment to his people and his ability, whatever the circumstances, to be resilient throughout. The Shackleton Spirit – that’s what we need when leading our teams thorough change! Posted on April 8, 2016 by Jean. This entry was posted in change, goals, leadership, tools and tagged change management, team leadership. Bookmark the permalink.